Delicious & versatile with Veetee rice! 1. Bring a small pot of salted water to a boil. Add the peas and cook according to package directions until bright green and tender. Drain well and set aside to cool slightly. 2. 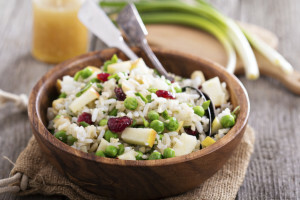 In a large bowl, combine the cooked rice with apples, cranberries, brie and herbs. Stir in the peas. 3. In a small bowl, whisk together lemon juice with the Dijon mustard, olive oil, sea salt and pepper. Taste and add more lemon juice or seasoning if you like. Drizzle the vinaigrette over salad and toss well to coat evenly. Serve immediately or refrigerate for up to 1 hour.